Maine canoe trips, kayak tours, rentals, & river guides. Guided, fully outfitted trips exploring Maine's classic rivers! 2019 Rates & Dates! Maine's outstanding summer/fall canoe trip is lively yet not intimidating with rapids perfect for learning canoe skills. This gem is a Maine classic! Name means "where the guides play" (jk). Truly wild from headwaters to the sea, one of the few completely natural flowing rivers in the eastern US. The grandeur of the North Maine Woods flows north amidst 3.5 million acres of forest lands. The natives named it Woolasticook meaning "goodly river". Maine's famous river features primarily a flatwater trip flowing through classic Maine scenery with just enough rapids to make it interesting. The best of the best in eastern Maine! Abundant wildlife, rich tangible history, and beautiful island scenery- possibly the finest half-day sea kayak tour in all of Maine! Great family trip! With just a touch of whitewater and a great picnic spot this is a wonderful way to experience a Maine river by canoe. Beginners welcome. Explore an historic island nestled between the easternmost settlements in the U.S. You may also catch a glimps of seals and porpoise playing in the tide. One of Maine's premier river trips features fun, easy whitewater amidst the forrested scenery of eastern Maine. If you are looking for a river adventure, this is it! Island hop through one of estern Maine's beautiful archipelagos searching for wildlife, exploring pocket beaches, and maybe even hike to a lighthouse. Daily and weekly rates with delivery available right to your vacation rental! to reserve your equipment today! Rented equipment can either be picked up at our rental shop located at 168 Main Street, Machias or any amount of equipment can be delivered to you and picked up within a 30 mile drive of Machias for a one time fee of $20-$45. Deliveries include transportation of rented equipment only, NO passengers or personal equipment. Weekly rates do not apply to multi-day self-guided trips. See below. Information is free, good information is free with rentals! Water levels in the St. Croix are regulated by a paper company owned dam giving the river reliable water levels throughout the May-October season. Canoeists in the northeastern U.S. looking for a true spring wilderness trip will be happy to discover this remote, untamed river nearly impossible to run the same way twice is within a days drive. Sunrise specializes in custom itineraries for large groups including youth camps, scouts, school groups, paddling clubs, and corporate oraganizations as well as private parties including family trips and bachelor parties. or call and let us know what you have in mind, we have the equipment and resources to get your ideas afloat! With our guides you are not only travelling with seasoned veterans, you are part of an eastern Maine tradition. Our guides are Master Maine Guides with over 20 years of experience leading commercial trips but they also share a common background as pupils trained in the Recreation Management program at UM Machias. For 30+ years this program steadily produced qaulity outdoor professionals steeped in the traditions of the Maine outdoors including National Park Rangers, US Forest Service Rangers, Search and Rescue Professionals, Maine Game Wardens, and Registered Maine Guides. 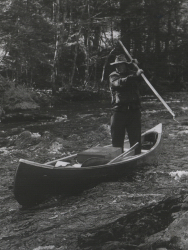 Rob Scribner is a third generation Maine guide and graduate of the legendary Outdoor Recreation Management program in his home town of Machias. Some of his earliest memories are of being in a canoe but Rob is equally at home navigating thick ocean fog on an ebb tide as poling up a swift rapid. "Most river guides are not interested in leading trips on the ocean but every rapid I run is in such a rush to find the sea it just seems natural I'd end up there too from time to time." Rejuvenated is the soul set free on a wilderness trip! We all need time away from our every day lives and we all crave a break from civilization at least once in a while. But there is more to a wilderness trip than simply being away from it all. Wilderness trips are about the challenge of learning and using skills that most of us do not rely on in our every day lives and the reward of having those skills take us to amazing places few will ever see while creating bonds with fellow adventurers that are otherwise unimaginable. Simply put, the longer the wilderness trip the more reluctant the participant is to re-enter civilization. Of course the lure of a hot shower and a comfy bed helps ease the transition but doesn't that state of mind sound a lot more rewarding than being ready for your vacation to be over? Washington county, roughly the size of Rhode Island and Delaware put together, contains all the territory extending east of the main body of the state and so being the easternmost county in the United States it's official nickname is "the Sunrise county". Washington county is largely undeveloped featuring the states only expansive combination of rivers, lakes, and coastline providing hundreds of miles of canoeing and kayaking amidst unbroken natural scenery. "The Sunrise county" lies just beyond Maine's mainstream tourist destinations. If you want to breathe, stretch, explore, and enjoy pristine waters without inevitably sharing the experience with a crowd then canoe the Machias and St. Croix rivers, sea kayak the Bold Coast, paddle the Downeast Lakes Water Trail, or explore the regions many intimate lakes and ponds...you do not have to be an expert to enjoy these wilderness waters and you will return with a story worth telling about! You can also let us know what you are interested in by filling out our online form.